Molly Bloom once ran the world’s most exclusive underground poker games, attracting A-list celebrities, hedge fund magnates and, eventually, the Russian mob. After she began raking her own operation she was indicted by the FBI along with the Russian mafia. 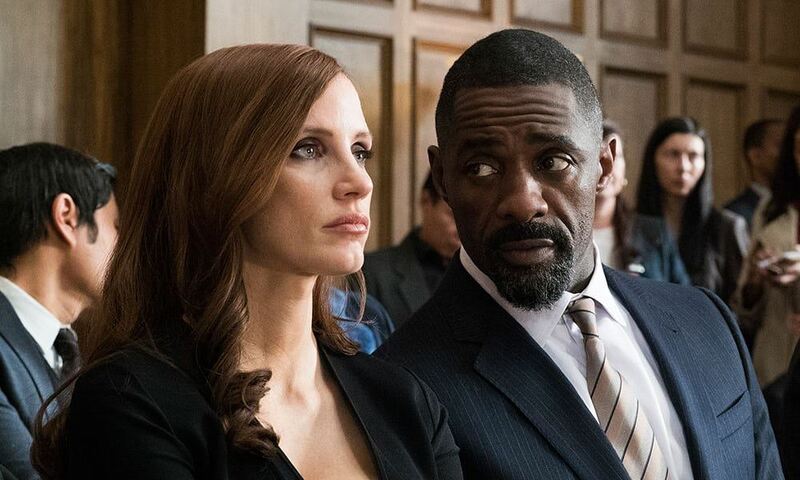 The majority of Molly’s Game is told from inside the office of Molly’s reluctant lawyer, Charlie Jaffey (Idris Elba). Recounted by Molly (Jessica Chastain) through a series of flashbacks, narrative momentum is kept at full tilt, while reliability is kept very much close to the chest. None more so than with ‘Player X’, the celebrity poker player who is instrumental in getting Molly her start as the ‘Princess of Poker’. Played by Michael Cera, the real identity of Player X remains a mystery. This is Chastain’s picture, convincing in equal measure as glamorous poker proprietor and would-be winter Olympian, tragically passed over after a freak accident at the start of her career. Opening on the slopes of Molly’s Olympic trials, Sorkin’s directorial verve is as evident as that of his screenwriting, both talents working in tandem to establish an impatient staccato to the visual language. If there’s a weak link, it’s Kevin Costner as Molly’s psychologist dad, whose patriarchal parenting is set up as the inciting incident for Molly’s rebellion following her skiing accident. As motivation for Molly to make her own way in the world, this works fine, but is ultimately fumbled when Costner tells her it was all just acting out against his philandering when she was a child. Iffy too is Sorkin’s tendency to linger on Chastain’s numerous figure-hugging outfits. She’s playing the part of the glamorous, untouchable hostess, but all too often the camera shifts from ridiculing her gawping admirers to becoming one of them, rarely shooting Molly as anything other than fantastically desirable. Nevertheless, the poker scenes themselves are never less than entertaining, interested less on the plays themselves and more on the compulsive personalities making them. These scenes, particularly a set piece with notoriously-awful player ‘Bad Brad’ (Brian d’Arcy James), have a vitality reminiscent of 1990s-era Scorsese. But here, that vitality comes from an otherwise marginalised perspective, simultaneously exploiting and mocking these men drunk on their own egos and compulsions. And unlike your typical Scorsese antihero, Molly has an integrity that is literally put to the crucible. With Sorkin’s signature whip-crack dialogue driving an astonishingly assured directorial debut, Molly’s Game is an exhilarating, superbly crafted crime drama.